WHAT LURKS IN THERE? Children play by the shore of The festivals, or rituals, started approximately 2500 years ago in southern China along the banks of the Yangtze River and were originally carried out to please the Asian water dragon deity. The rituals often included human sacrifices and violent battles between crew members of competing boats who hurled stones and struck opponents with bamboo sticks. It was considered to be unlucky if there wasn't at least one drowning during the course of the event. 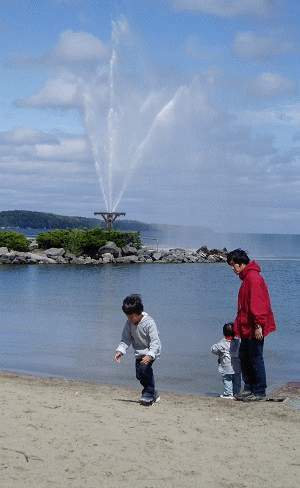 Kempenfelt Bay in Barrie, Ontario. Legend has it that the bay is home to the sea monster known as Kempenfelt Kelly. No country in the world has more lakes rumoured to house lake monsters than Canada. (Jason Loftus/The Epoch Times)Dragon boat festivals are once again underway all across Canada, and while tens of thousands of people will attend the events, very few are familiar with the ancient history of the tradition. The Asian water dragon is not alone in its class. In Canada alone there are many stories and eyewitness accounts of aquatic beasts comparable to the Chinese water dragon. These aquatic beastie boys and girls have been given names; Ogopogo, Champ, Manipogo, Kempenfelt Kelly, The Cadboro Bay Sea Serpent, The Thetis Lake Monster, The Lake Erie Monster, The Wendigo, The New Brunswick Lake Utopia Monster — the list goes on. The number of eye witness accounts of these underwater monstrosities coming to the surface is staggering, yet even with the help of giant nets, submarines, underwater cameras, sonar, and crews of observers no solid evidence has been ever been obtained to prove that these monsters exist. The most famous of Canadian aquatic beasts is undoubtedly Ogopogo of Lake Okanagan, located in the south central interior of British Columbia. According to numerous sightings each year, Ogopogo is 20 to 50 feet long with a horse shaped head and snake-like body and favours an area of the lake south of Kelowna near Peachland. The indigenous people of BC knew of the monster which they called N'ha-a-itk, or Lake Demon, long before European settlers came to Canada. They placed the monster's lair at a cave under Squally Point near Rattlesnake Island. According to Ogopogo expert Arlne Gaal, the First Nations' custom of offering a small animal to appease the lake demon when travelling near the lair was adopted by fearful European settlers who also patrolled the shoreline, in case the monster attacked. Lake Champlain, a lake mostly within the borders of the United States but stretching north into Quebec, is home to another oceanic oddity: Champ. There have been over 240 sightings of Champ, the first of which, by Sheriff Nathan H. Mooney in 1883, reported a gigantic water serpent over 25 feet in length which rose five feet out of the water. Other eyewitnesses present at this event were close enough to clearly see round white spots inside the creature's mouth. Manipogo, of Lake Manitoba, has a history dating back to 1908. There have been numerous sightings of the creature which is rumoured to be snake-like in appearance with a long tubular body and a head comparable to a sheep's. In the 1950's the Manitoba Government launched an official expedition to search for the serpent to no avail. A photograph taken by two fishermen in 1962 showed what they said was an image of Manipogo, but was not clear enough to be considered verifiable proof. Thetis Lake is a very popular swimming destination for Vancouver Islanders during the summertime, and is also the reputed home of the Thetis Lake Monster, a fact widely unknown among swimmers. This freakishly scary fiend of a fish is quite different from most lake monsters in that it has a humanoid body similar to that of the beast from the film The Creature from the Black Lagoon. In 1972, two teenagers on the shore of the lake said they witnessed a scaly, humanoid form suddenly rise from the water. The two teens turned and took off, but the creature caught up and cut one the boy's hands with a barbed fin on its skull. There are many theories that attempt to explain these unsolved modern mysteries. Many believe that the monsters are relics from another time; prehistoric beasts who survived the ages. Some say the creatures are spiritual guardians who protect their sacred aquatic turf. Others believe that they are an undiscovered species of long necked seal. There has been much speculation that the monsters are actually plesiosaurs; aquatic dinosaurs from the Triassic period (over 200 million years ago). Still, most people are sceptical and believe that the beasts are nothing more than floating logs, strange reflections off of waves, or flat out hoaxes. One notable similarity among these elusive entities can be found in the places they are rumoured to dwell. Almost all of the river and lake systems that the monsters call their home are, or have been at some point, connected to the sea. They also all harbour, or have harboured migratory fish, and are deep, cold bodies of water. So, if your summer plans this year include outdoor water sports, you might want to think twice before jumping in — you never know what might be waiting for you just below the surface.